It is one of the important Hindu festival that is celebrated across India, Nepal and Bangladesh. The name is derived from Snaskrit” Dasha-hara “means removing of bad.The harmony of different cultures and customs in the social fabric of India is best experienced during Dussehra/ Navratri celebrations that take place in every state. The entire country wears a celebratory look and exudes elegant ethnicity. Some states celebrate Durga’s victory over the buffalo demon Mahishasura, while Lord Rama’s triumph over Ravana the King of demons is celebrated in some states. However, victory of the good over the evil is the common purpose of celebrations all over the country. Whichever part of India you visit during the festival, you will find smiling faces, happy minds and devoted souls in common though the way of the festivity is different in different .It also goes by Dasara/ Vijayadasami/Navratri /Dashera in different regions of India. Durga (Shakti) symbolizes the power of the Supreme Being that maintains moral order and justice in the universe. Durga stands for the unified symbol of all divine forces; Strength, Morality, Power, Protector. Dasara is celebrated on the tenth day of the month of Ashwin ( Ashwayuja masa) according to the Hindu calendar which corresponds to September or October of the Gregorian calendar. The first nine days are celebrated as Maha Navratri the ‘nine nights’ or Sharada Navratri and culminates on the tenth day as Dasara. Mahishasura is a demon king in the form of buffalo became powerful and was creating a havoc in all the three worlds. As no one was able to defeat him all the powers ( Bhrama, Vishnu, Siva) became one and took a form of female virgin with ten hands the Shakti called Durga who was riding Lion , in this process she received special weapons from gods with the help of them she raged war against Mahishasura which took place for 9 days and nights. Finally on 10th day the demon was killed by fierce goddess Durga. On this day is threta yug , king Rama , the 7th Incarnation of Lord Vishnu killed the demon king Ravana with the help of his brother Lakshmana, great disciple Hanuman and with the help of army of monkeys to free Rama’s beloved wife Sita from Ravana who abducted her from Rama in his absence. It is also said that Lord Rama performed Chandi Homa and had blessings from Maa Durga before killing Ravana. Many people also perform Aditya Homa and also recite Sundara kanda , Ramacharitha Manas on these days. This day also marks the end of agyatavas (exile) of Pandava’s. During the 9 days of festival, in the evening Ramleela plays are organized. As this festival indicates the victory of good over evil. Dussehra or Maha navratri or Sharad Navratri festival is celebrated for 9 days with rituals that vary state wise but with equal verve and enthusiasm. Burning of the effigies of Ravana, his brother Kumbhkaran and son Meghnath are carried out.It exhorts people to kill the bad in them and follow the goodness. Mata Shailputri is a daughter of ‘Parvata raju’ (mountain king) Himalaya. She is the first among nine avatars of Durga and worshiped on the First day of Navaratri. In her previous birth, she was ‘Sati Bhavani Mata’, the daughter of King Daksha. Mata Shailputri, also known as Parvati got married with Lord Shiva. On the first day of Durga Navratri, Paravathi Devi is worshipped. Mata Shailputri holds a ‘Trishul’, a weapon, in her right hand and a lotus in her left hand. She rides on bull. She has pleasant smile and blissful looks. Mata Chadraghanta is worshipped on the thrid day of Navratri. She is very bright and charming. Durga Maa is astride a tiger, displays a golden hue to her skin, and possesses ten hands and 3 eyes. Eight of her hands display weapons while the remaining two are respectively in the mudras of gestures of boon giving and stopping harm. Chandra Ghanta, meaning supreme bliss and knowledge, showering peace and serenity, like cool breeze in a moonlit night. Skanda Mata is worshipped on the fifth Day of Navratri. She had a son ‘Skandaa and holds him on her lap . She has three eyes and four hands; two hands hold lotuses while the other 2 hands respectively display defending and granting gestures. The great and legendary Sanskrit Scholar Kalidas created his two masterpieces works “Raghuvansh Maha Kavya” and “Meghdoot” by the grace of Skandmata. She is considered as a deity of fire. She rides on Lion. Mata Katyayani is worshippedon the the Sixth Day of Navratri. 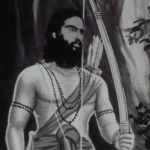 Rishi Katyayan observed a penance to get Jaganmata as his daughter. She blessed him and took birth as his daughter on the bank of river Jamuna for getting Lord Krishna as a husband. She is considered as prime deity of Vraj mandal. Ma Katyayani has three eyes and four hands. . One left hand holds a weapon and the other a lotus, she rides on Lion. Mata Kalaratri is worshipped on the Seventh Day of Navratri. She is dark and black like night, hence she is called as ‘Kalratri’. Her hairs are unlocked and has three eyes and four hands. While the remaining 2 are in the mudras of “giving” and “protecting”. Her vahana is a faithful donkey. The destroyer of darkness and ignorance. She spills out fire from her nostrils. She holds a sharp Sword in her right hand and blesses her devotees with her lower hand. As she blesses her devotees with prosperity, she is also called as ‘Shubhamkari’. Mata Maha Gowri is worshipped on the Eight Day of Navratri. Maha Gauri looks as white as moon and jasmine. She has three Eyes and four hands. Peace and compassion radiate from her being and she is often dressed in a white or green sari. She holds a drum and a trident and is often depicted riding a bull. Her above left hand is in fearless pose and she holds ‘Trishul’ in her lower left hand. Her above right hand has tambourine and lower right hand is in blessing mudra. Mata Siddhidatri is the worshipped on the Ninth Day of Navratri. Maha Shakti gives all the eight siddhis -Anima, Mahima, Garima, Laghima, Prapti, Prakamya, Iishitva and Vashitva. According to ‘Devi Puran’, the supreme God Shiva got all these siddhis by worshipping the supreme Goddess Maha Shakti. With her gratitude, his half body has become of Goddess, hence Lord Shiva’s name ‘Ardhanarishvar’ has become famous. According to some sources she drives on Lion. Other sources say, she is seated on lotus. Siddhidatri Devi is worshipped by all Gods, Rushis, Muniswaras, Siddha yogis, and all common devotees who want to attain the religious asset. In North India, especially in Himachal Pradesh, Uttar Pradesh, Uttarakhand and Bihar, It is a tradition to plant barley seeds in earthen pots on the first day of Navratri. On the day of Dasara, the nine-day old sprouts called as noratras or nortas are used as symbols of luck. Men place them in their caps or behind their ears. Kullu Dussehra is celebrated in Kullu Valley of Himachal Pradesh commences on the tenth day ‘Vijaya Dashami’ day and continues for seven days. Its history dates back to the 17th century when local King Jagat Singh installed an idol of Raghunath on his throne as a mark of penance. After this, god Raghunath was declared as the ruling deity of the Valley. In South India, There is an exhibition of toys that is known as “Bombe habba” in Karnataka, “Bommala Koluvu” in Andhra Pradesh,”Bomma Gollu”in Kerala and Golu in Tamil Nadu. There is a legend associated with this exhibition of toys, as Durga needed power to kill Mahishasura all other gods and goddesses transferred their power to her and they all stood still as statues. To respect the self-sacrifice of these deities during the festival days, Hindus revere morities, which are small statues in the shape of particular gods and goddesses. This exhibition is for 9 days and Vijayadasami. In all parts of South India, on 9 day they do Ayudha puja where they sanctify Vehicles and on this day people buy new things. In kerala and Tamil Nadu, On this day is also celeberated as Saraswathi Puja, all the kids put their books near Goddess Durga to seek her blessings and are later taken back on vijayadasami. For many kids between the ages 3 to 5 Initiation of Writing is done on this day with the blessings of goddess Saraswathi. In Telangana, On this day all younger family members usually pay respects to their elders by giving them leaves of Shami tree/ Jambi tree, and seeking their blessings. During these 9 days of navratri they also celebrate Bathukamma, it starts on Mahalaya Amavasya and ends on Ashwayuja Ashtami, Durgashtami with is 2 days before Dussehra. Bathukamma is a beautiful flower stack, arranged with different unique seasonal flowers in seven concentric layers in the shape of potter’s clay like a cone. In Telugu, ‘Bathukamma’ means ‘Mother Goddess Come Alive’ and Goddess Maha Gauri-‘Life Giver’ is worshipped . In the evening, women gather in large numbers with their Bathukammas in open areas of their locality, all women will form a circle around the Bathukamma start singing folk songs by clapping their hands and revolving around the Bathukamma, synchronizing steps and claps in unison provide a splendorous look to the festivities. Women seek good health, prosperity and happiness for their families. The songs are to invoke the blessings of various goddesses. Every day after performing dance and songs the Bathukamma is immersed in water. In Temples of Andhra Pradesh Goddess Durga is decorated and special pooja’s are performed to her on different aspects like Bala Tripura Sundari, Mahishasura Mardhini, Annapoorna, Kali, Raja Rajeshwari, Kanaka Durga, Lakshmi, Saraswati and Gayatri Devi. In Mysore, On Vijaydashami day, at the culmination of a colourful 10-day celebration, the goddess Chamundeshwari is worshiped and then borne in a grand procession on a Golden Ambari or elephant-mounted throne through the city of Mysore, from the historical Mysore Palace to the Banni Mantapa. Banni is the Kannada word for the Sanskrit Shami, and Mantapa means “Pavilion”. One gets a chance to see the illuminated Mysore palace, its ethnic and royal culture. The present Mysore king holds royal durbar on this day with his family members. On 10th day the king’s sword is also taken in big procession. In Madikeri, Dasha-Hara is celebrated in a different style. It has a history of over 100 years. Dasha-Hara begins with Kargas from four Mariamma Temples. There is a procession of 10 Mantapas from 10 Temples on the night of Vijayadashami. Different stories from parts of Ramayana or Mahabharata are chosen as themes for each tableaux from each of the 10 temples and a grand show is put up in the middle of the night and the best Tableaux is awarded each year. Later, these cars proceed towards “Banni Mantap” near mahadevapete in the town where Pooja is offered. In Western India, Especially in Maharashtra people worship the Apta tree and exchange its leaves (known as golden leaves) as a symbol of gold wishing each other a bright and prosperous future. The tradition of exchanging Apta leaves is symbolic of Raghuraja, an ancestor of Rama and Kubera. Many artisan communities ritually worship tools of all kinds and they are given rest on this specific day. Marigold flowers are particularly associated with and sold in significant quantities during this festive period. They are used for both worship and decorating homes and work-places. On this day people also ritually cross the border of their community in a ceremony known as (Simollanghan means crossing the border).In ancient times kings used the feast of Dasara to cross the frontier and fight against their neighboring kingdoms. In Gujarat, Navratri is celebrated through music, dance and food. People stick to their age-old culture on nine days of the festivity, no matter how modern they are in the 21st century. Women in lehenga cholis and men kedias look their best on festive evenings when they gather to perform Garba and Dandiya Rasa, the most popular folk dances of Gujarat. The cultural celebration centers on the worship of Ma Amba, another name of Goddess Shakti. In Orissa, Durga Puja is observed with rituals for a period of 10 to 16 days, known as Shodasa Upachara. The goddess Durga is also worshiped by devotees in different pendals throughout the state. The pendals are beautifully decorated. The last day of the Sharodiya Durga Puja is known as Vijayadashami. After the last ritual Aparajita Puja is performed to the goddess, a tearful farewell is offered to her. The women offer Dahi-Pakhal (cooked rice soaked in water, with curd), Pitha (baked cakes), Mitha (sweets) and fried fish to the Goddess. Most of the community pujas postpone the farewell as long as possible and arrange a grand send-off. The images are carried in processions known as Bhasani Jatra or Bisarjan Jatra around the locale and finally are immersed in a nearby river or lake. After the immersion of the deity, people across the state celebrate Ravan Podi, in which they burn an effigy of the demon Ravan. In Bengal, Dussehra is celebrated as Durga Puja. Deities of the goddess Durga are worshipped for five days. It is said that Goddess Durga along with saraswathi, lakshmi and her son’s Ganesha and Kartekaya visit their maternal home and on the fifth day (Vijaya Dashami) immersed in a river or pond and is sent back to her home every year, this is referred as Durga Bisarjan/Bhashaan. The cityscape is dotted with hundreds of different theme based pandals where the life-size idols of Durga and other family members are worshiped for 5 days. The city skyline is lit with beautiful lightings from twilight till wee hours. Kolkata does not sleep for 5 days as the people begin to hop around pandals in the evening and continue throughout the night. In Nepal, it is called as Dasain . This is the biggest festival of the year in Nepal. Among the Newars, it is known as Mohani. The 10th day of Dasain is Vijayadashami, on which elders put Tika and Jamara on the forehead of younger members of the family. Jamara is sown on the first day of the festival which becomes greenish yellow of about 10–20 cm length which represent symbol of victory. Some ethnic groups receive Tika and Jamara only on the 10th day whereas others continue to receive until the following full moon. Depending upon the relationship, people offer ‘Dakshina’ after receiving the Tika and Jamara. On the eighth day of the festival, people offer sacrifice to goddess Durga. Meat is heavily consumed after the sacrifice taken as the gift of god. People visit their relatives and exchange greetings throughout the 15 days of the festival. Temples of goddess Durga are crowded throughout the days of the festival in different parts of the country. In Bangladesh, Dussehrais a five-day long festival and is celebrated in mandaps. The largest festival is held at Dhakeshwari temple and Ramkrishna missionary in Dhaka. On the day of Dasha-Hara, clay statues of the Goddess Durga are submerged in rivers. The Puja is performed with turmeric and other pooja items, which are added to the river in order to help the water yield better crops. On this festival, many people have upvas ( fasting for all the 10 days ) and especially upvas recipes and lots of regional and traditional sweets, savories and main course food is prepared in every home and is also exchanged with friends and relatives.